Keeping Little Ones Busy While Homeschooling Older Kids (Or During Any Other Time!) – Homeschooling in the "D"
Pinterest never lets me down, I tell you. I was just a-scrolling through my feed as usual when I came across a pin for a quiet book for toddler. Having a toddler-almost-preschooler and baby on the way, this peaked my interest. Basically, quiet books are books made of soft, quiet materials that have several different activities that toddlers/preschoolers like. There are many different ways to make them and tons of free printables available on the ‘net, or you can create your own. I created a whole new Pinterest board for quiet books. (BTW, make sure to follow me on Pinterest if you’re not already!) I’m gathering the materials to make my first one. We’re having issues with our printer, but as soon as it’s working, it’s on. I can’t wait! 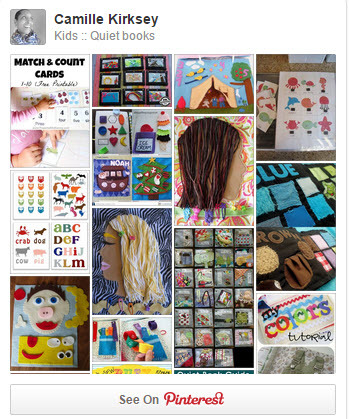 Follow Camille Kirksey’s board Kids :: Quiet books on Pinterest. Have your kids tried quiet books before? Let me know in the comments.